Did many searches for the original story, but it appears lost. Posting again. The buck was used for a guess the score contest, but can't find that either. 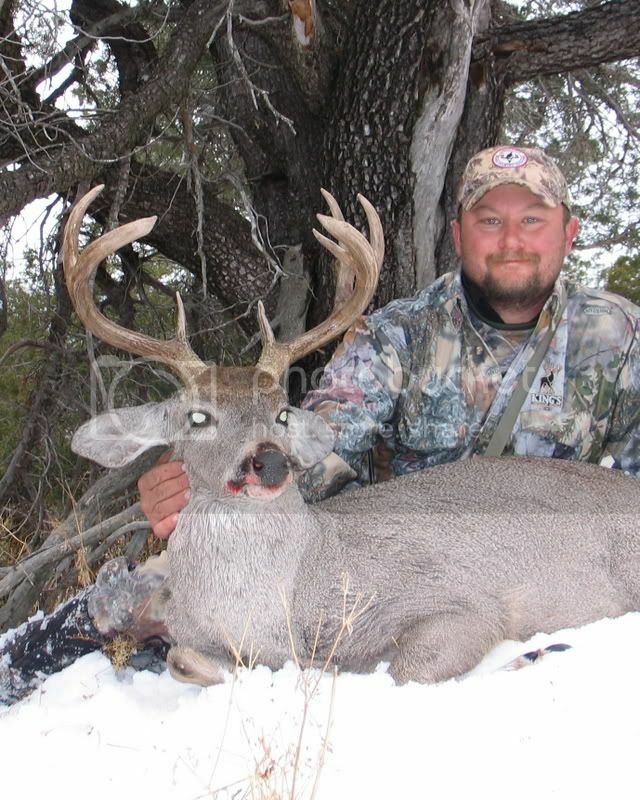 After hunting in Unit 29 several years and having taken bucks of 97, 96, 95, 82 and 68 inches, my good friend and hunting buddy and I decide we would set a goal of getting a Boone and Crockett Coues. 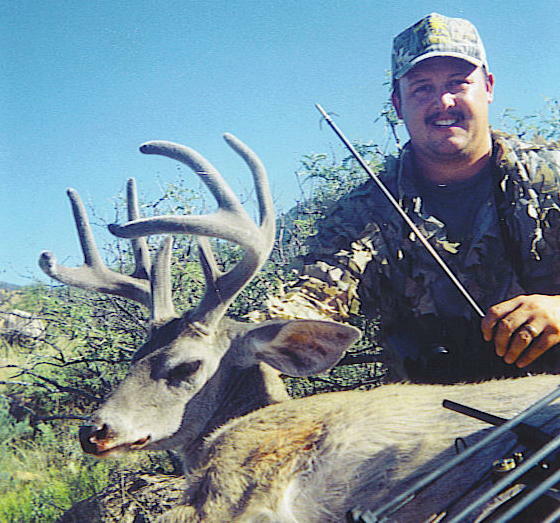 I look in the record books, count the number of 110+” bucks taken out of each unit, and decide unit 36 held the greatest possibility, based on the number of record class Coues in relation to the number of tags in the unit. 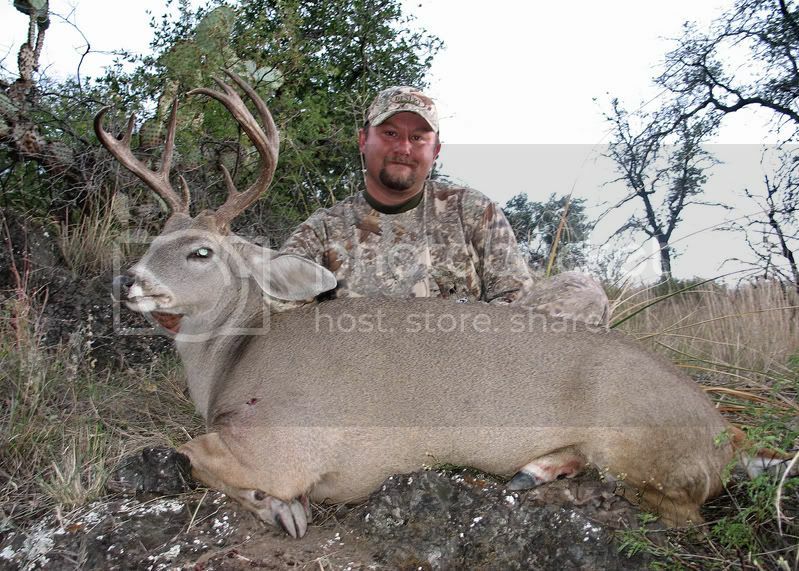 I also noted that to reach 110” most bucks were 4 pointers. So that was our goal- a four point out of unit 36. We applied for and drew December tags in our chosen unit. But December draw odds were more forgiving in 1991 than they are today. Topo maps for the unit are purchased. A letter is written to the unit game manager asking for his opinion which area held the best trophy potential. My friend’s dad was a private pilot, so one day over Thanksgiving we fly down from Scottsdale, fly over the unit, and circle over the canyons which look the best. On another weekend we drive down and look at several of the areas from ground level. Finally, on the 26th of December, after spending Christmas with the families, we drive down to set up camp before the next day’s hunt. In the dark of the morning, we plod across the flat and detour around some mesquite thickets after determining that they were impenetrable. Up a canyon we hike and arrive at the base of the chosen hill at the first hint of light. Huffing upward, we crest over a ridge and glass the newly seen draw. A couple of does. We trudge upward, occasionally stopping to glass, and see that the does have made their way over the top. We follow. Carefully, we crest over to look into the small area below, but are treated with a deerless view. 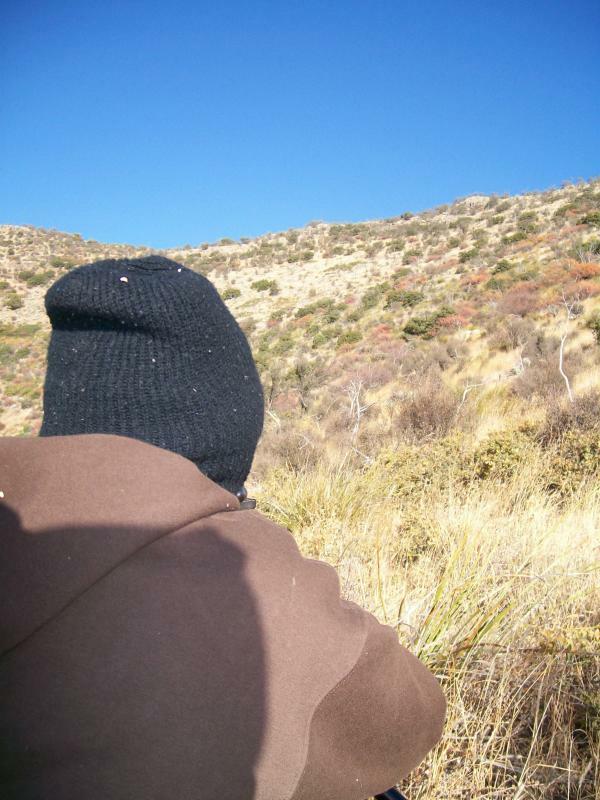 We continue along a ridge, and glass three other hunters on a different knoll half a mile away. We circle to a different point and glass across the main canyon. Nothing but some does in the ocotillo a long distance down the canyon. After lunch, we hike on the backside of a sharp ridge to a point of rocks. There we can glass a large bowl to the east, and slopes to the south and west. We decide to remain here till dark and settle in for the afternoon. About an hour before sunset, my friend says he sees deer in the basin to the east. They have come out of the trees to begin feeding. I ask if there are any bucks, but he cannot tell through his Pentax binoculars. I cannot tell either through my 10x25 Leitz. So I set up the Cabela’s spotting scope and tripod for a better look. I see that the one buck with the small group of does has four points on a side. Yes. A Booner is my thought. The excitement level heightens. Since he spotted the deer, I ask him if he wants to go. To my surprise, he says “you go.” I was not about to argue. As the deer were 600-800 yards away and too far to shoot from where we were, I quickly stuff the spotter and tripod in the pack, shoulder the pack and pick up the rifle. I would need to go back around on the backside of the ridge we are on to remain unseen, go a little to the east and down a finger closer to the buck. My friend would stay and look from our present position. After about 15 minutes, I am in position. Pulling up the binos, I scan the area. I don’t see the buck. Where did he go? I look and look, and emotions start to sink as I think he may have moved off. Finally, the buck stands up. He had bedded in some tall brush and grass during my stalk. The moment has finally come. I lay the pack down and rest the rifle across the daypack. I look through the scope but cannot find him on 10 power. I crank it down to 3.5. Still cannot find the deer. I look through the binos, and he is still standing there. Quickly I look through the scope again. Again I cannot locate the buck at high or low power. Again, I look through the binos. He’s still standing there. I look through the rifle scope again with high and low to no avail. Frustrated and getting frantic, I look through the binos again to see the buck still standing there. For a fourth time I look through the rifle scope. Finally, I have him centered in the scope. He’s quartering away. I slip off the safety, take few breaths, exhale, relax, and squeeze the trigger. I see the buck hunch up, but still stand there, quartering away. A gut shot reaction by the deer, but the hold felt good. I chamber another round into the 7 Mag, and with a second 140 grain Partition, he collapses and tumbles a short ways down the slope. Relieved to have finally made the shot, I gather my stuff, holler to my friend and make my way over to the trophy. I thought he was a four point, but he is not. He has several initially unseen points and kickers to give him a total of 13 points. A cool nontypical. My friend makes his way around, and he asks what took me so long to shoot. I explain the story. After pictures and then field dressing, I tie the head and cape to the pack and we climb down the mountain. I will return tomorrow with a pack frame to pack out the meat while my hunts another mountainside. Still surprised by having my friend let me shoot the deer he spotted, I later asked him why. He was just returning the favor when on a Colorado archery elk hunt I had offered to call in a bull I spotted while he shot. That was another great hunt. 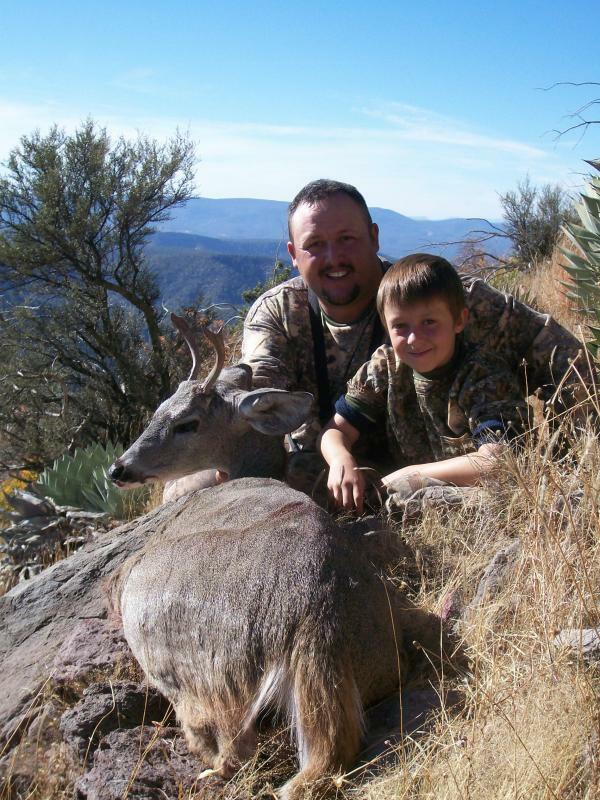 Two years later we are hunting Coues again in the same canyon in unit 36. 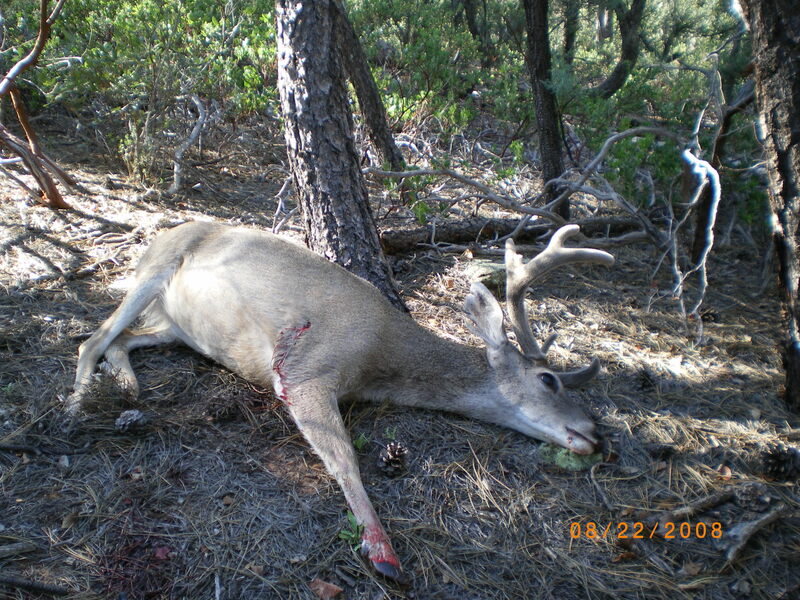 We spot a buck that has very similar antler point characteristics as the one from two years previous. However it is a little smaller and my friend decides to let him grow another year. He has not drawn a December tag there since. 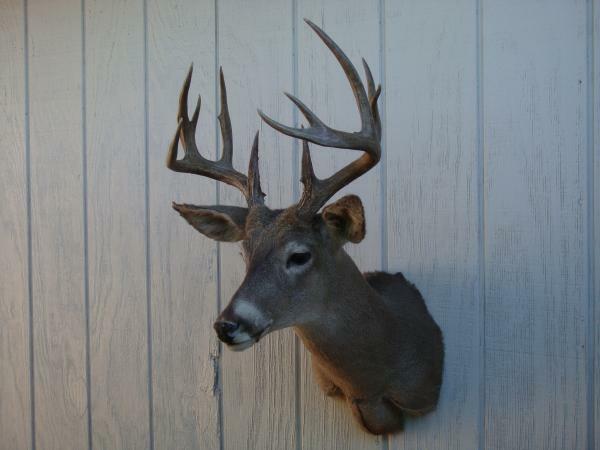 I love the height of that buck, if I ever get the chance to be picky I'd love a high rack buck. Very nice buck. You consistently share current events with us and I look forward to it. I really enjoyed that story from the past, thanks. I like seeing all these great bucksthis time of year. It sparks the anticipation for the upcoming fall hunts. Great buck Amanda. One of the tallest I have ever seen. Interests:Hunting, Long Range Shooting, Being in the Outdoors with my family and helping people. Mine is a 111" followed by a close 2nd @ 109 3/8". Both rifle. 111" buck I shot this year with great help from good ole Amanda. My 109 3/8" from 2006. Nice bucks Matthew!! 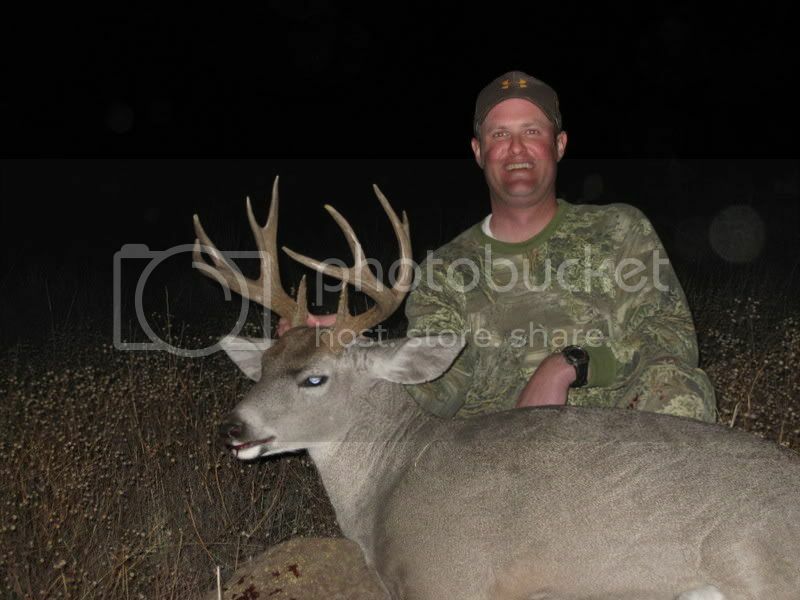 That sure was a great shot you made on that 111 buck!! I was watching it on video again the other day. I still don't know how you saw that buck's vitals from your setup in the tall grass and at last light. But you made a perfect shot. Hopefully I will get that video to you soon. 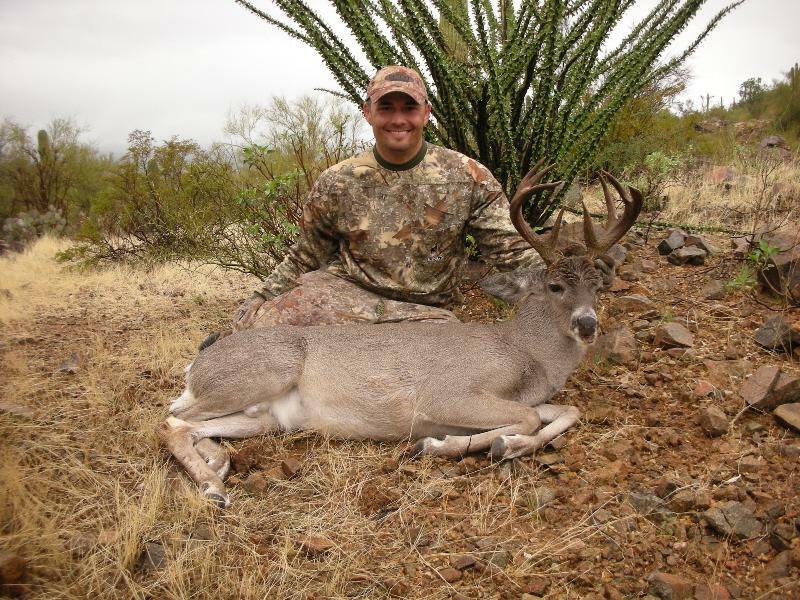 As for the details, the AZ buck was taken on an early 35B hunt. I just crawled into a small area that was surrounded by hunting pressure and glassed this buck up at close range. He was hunkered down and feeling safe until my .270 barked and turned his lights off with a perfect shot in the heart at less than 200 yards. 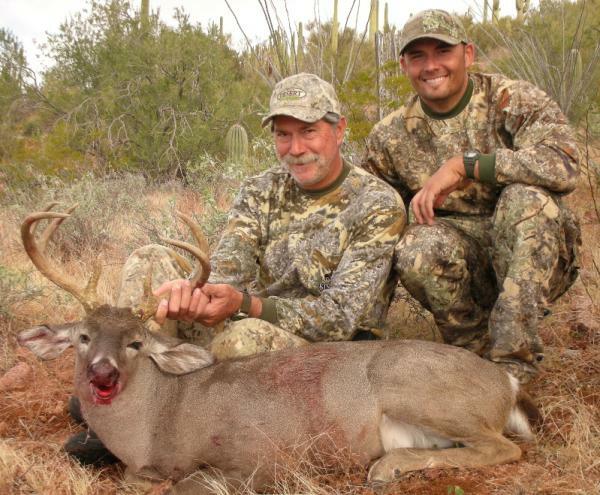 The Mexico buck was taken on a 1 day hunt with my Pops. Pops killed a 110" buck earlier on the hunt and after guiding duties were done, I was left with only 1 day to hunt for myself. The snow was very deep but Pops and I plowed our way to the top of a hill, sat down to eat a snack and glass for a bit and instantly I had this buck trailing a doe down the opposite hillside. It was 360 yards, I knew he had an inline extra and a good frame and that's all I needed to see, the tripod became the rest and the bullet was on it's way before he dissappeared. I'll never forget walking up and pulling his head up out of the snow for the first time with my hands on em' that first time! Those are beautiful bucks guys. Wow... Those are all great coues... Great pictures everyone! 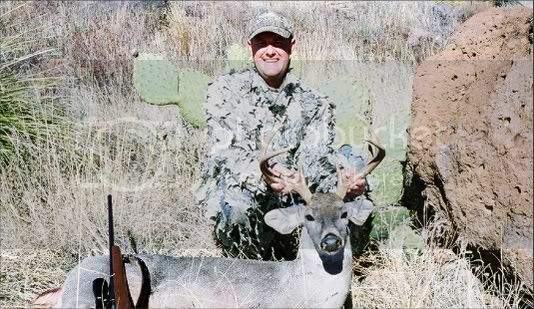 Here is my best and only coues deer that grosses over 107".....and my dads buck at 112". Hey Jim...isn't that buck you won first place in the big buck contest for Mexico?? my 108 buck took the second place. my 1st 100" archery buck. going to be very tough to top this! this is how I found him. Nice shot BH4Life! Right in the boiler room! 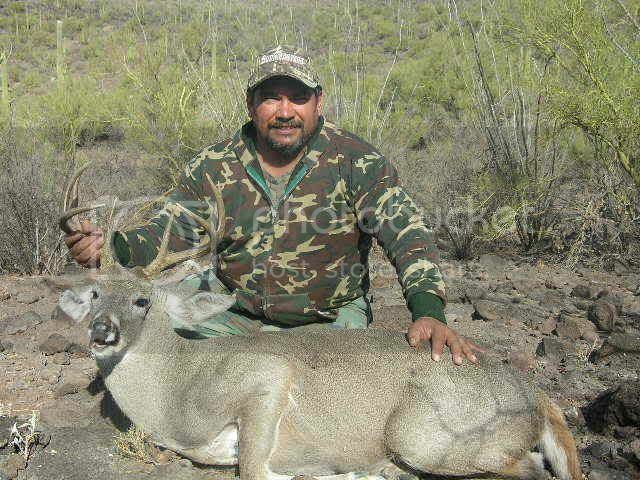 By the way.....my personal best is yet to come but here is a 108 Sonoran buck, my brother Tony holding the buck. THis is my best archery, but the picture of my boy is is one of my proudest moments. 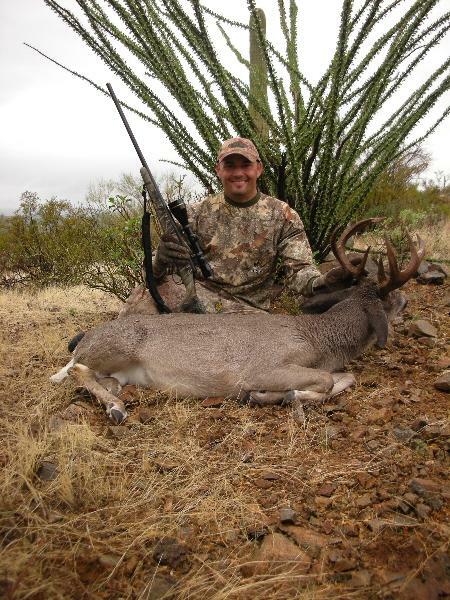 Gabe shot this buck last year in mexico and was 8 yeards old. He made a perferct shot at 340 yards.